"Great place going back in september "
"Had a great time went on my own and was made welcome by Eric the bailiff and all the Dutch anglers looking forward to going back in April 19 "
"An all round fishing gem ,you need to fish well then the rewards will come. Good job Eric and Thomas. " "Enjoyed a fab week at Grosely, caught 18 fish of various weights all over 30 lbs. Lovely surroundings ,great hospitality. Great location easy to reach from Le Havre. Will be back soon!" "I really enjoyed my week at Grosley and caught some lovely week. Eric was very helpful and friendly too. It is a beautiful place to relax. Only one down side was the number of rats in swim 21, they need eradicating." "Lovely lakes, great fishing and eric is a star"
"Eric is a very good asset to Grosley, he is very helpful and gives good knowledge of the swims. I am surprised you feel the need to charge €1 for a toilet roll, you charge sufficient for the holiday without asking more for an essential item. We didn't actually pay, as rolls were left by departing anglers. I am also surprised you call the venue a runs water, it clearly isn't anymore as most anglers catch only a small number of fish during their stay." "Great lake, friendly and helpful bailiff. Caught sturgeon, albino catfish, grass carp , carp and koi. Biggest carp 42.2lbs.will definitely be back. Andy swann "
"Brilliant fishing great bailiff swims could all do with a cutting of the grass facilities are good, outside area needs a tidy up. 39 fish including sturgeon, and a black and white koi Looking forward to the video/film back in September this year"
"Grosley is a great relaxing fishing holiday, peaceful, quiet and green surrounding. The fish are good quality, hard fighting and decent sizes. However the showers and toilets do let the lake down with outside the toilets there are old shampoo bottles, dirty mops and squeegees, the washing up sink you can't use it is covered in all this stuff. The toilets and showers are ok but don't seem to be cared for, they used to be clean on my every visit not now and finally where in the world does a four star holiday expect you to buy toilet rolls?..........outrageous. Summary fish good, facilities need more attention it is after all a holiday destination. " 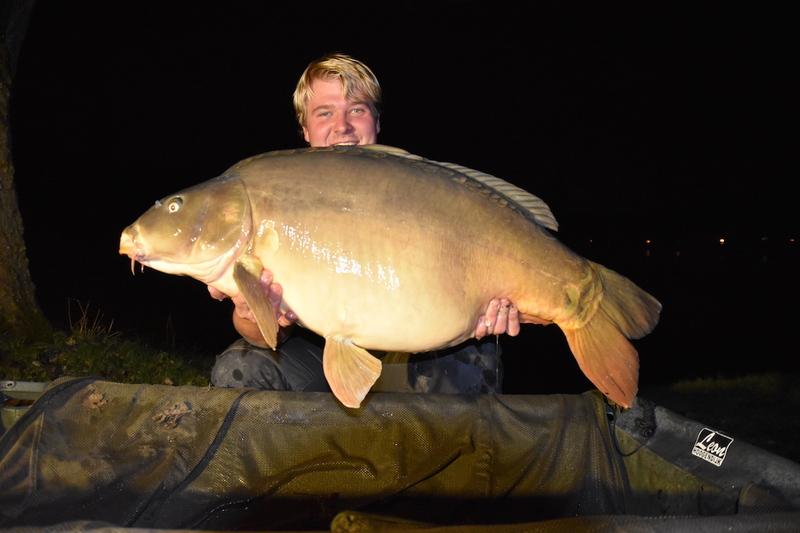 "Had a good time Eric does a great job Thanks"
"Good service from Eric thanks"
"We had a good week thanks"
"This was our 3rd time at the stunning Lac de Grosley. Put simply, Eric was fantastic!! I was a little disappointed there's only one chest freezer now though. The shower facilities are much improved. We WILL be back again. Lac de Grosley ❤️"
"I had such a great time at Grosley and Eric the bailiff is such a nice guy I have re booked within days of my return - Really really pleased "
"Ive have been coming for years Eric has done wonders on the lake and top man thank you Eric nice curry to see you soon Bill and Kay"
"We fished peg 13 once again, we caught fish throughout our 4 day stay, carp to 34lbs and 3 large sturgeon. As usual Eric was very helpful, you have a good bailiff in him. I still do not understand why you feel the need to charge the guests for toilet roll, surely an essential item as this should be provided. The worst part of the site is the shower block, Eric did manage to get 2 of the showers working while we were there, but the hand basins didn’t work, the utensil basin didn’t work, no water, neither hot or cold. This area really lets the site down and needs investment." "Great fishing, great lakes, eric is doing a fantastic job"
"Third visit to this lake . Had a slow start with the weather being very hot. Changed tactics and we then saw fish on the bank with 24 in total . Had a great week as I had two fish over 50lb with one at 27kg . Great lake, very helpfull bailiff Eric top man. Will be back." "Mark and Michelle are doing their very best to make all welcome. They have taken on a lot to deal with as the lake has been neglected, they are both equally working hard to make it work. Much better reception than the last years bailiff!" "Enjoyed the venue,bailiff was very helpful but the rats we're a problem.this is my 4th year here and never had a problem with the amount of rats as this year.i realise that you can never get rid of them but I feel an effort at pest control would keep them down.i don't agree with Eric's idea that nature will find a balance." "Ace weekend we both landed PBs can't sit to return Eric and wife were great Thank you for all your help in the arrangements Nick Gray"
"Great time again and to be honest was a bit slow after the recent flood. Thx to Eric for streaming the world cup for us. 2 of us are coming back in October for some late season action. " "Best fishing trip ever, lots of high quality fish 70 fish between the two of us for a weight of just over 2,000 lbs Fantastic result." "Great stay caught some nice hard fighting fish. Eric the bailiff is very helpful "
"Had a great time .eric as before is great.he has made so many improvements. Only had one fish between us ,but that's fishing, will be booking again soon. Many thanks, Debbie shore"
"On arrival Eric was absolutely brilliant but swim 8 was completely overgrown we couldn't see the lake at all sitting in the swim we lost 5 fish. And ended up with one hanging in the trees it is that bad it spoilt the fishing trip Sorry! Yours sincerely." "Great week at Grosley with over 60 fish between the 6 of us.... Biggest carp just over 48lb and biggest sturgeon at just over 59 lb"
"Always a pleasure to deal with and the lake and fishing are great. " "We were very unlucky with weather but still managed a few lovely fish. Grossly is a lovely lake brilliant facilities, great bailiff and full of large carp. We have already booked for next year. " "Thank you so much for wonderful holiday. Eric was great and the place is so good. I caught some high quality fish and smashed my personel best twice. I caught 9 in total and lost only one fish. The nearby town was lovely with all you need. Going again next year !!!!" "Couldn't fault anything at the venue, superb .Top marks !!!! had a great week, even booked a return for next year whilst we were there, although still awaiting the confirmation ( Sept 15 - 25th 2018 ). " Situated roughly a one hour drive from the port of Le Havre, Lac de Grosley lies in the valley of the river Risle in Normandy. However if you prefer to travel to Calais the lake is only 177 miles (285 km) which is an easy three hour drive. The nearest town is Beaumont-le-Roger which, although not very large, does have all the facilities you could require during your stay. The town of Rouen is the nearest major town and this is around a one hour drive away. There are two lakes on the site which are fringed with deciduous woodland, with majestic oaks and tall poplars, and open fields and both are easily accessible. 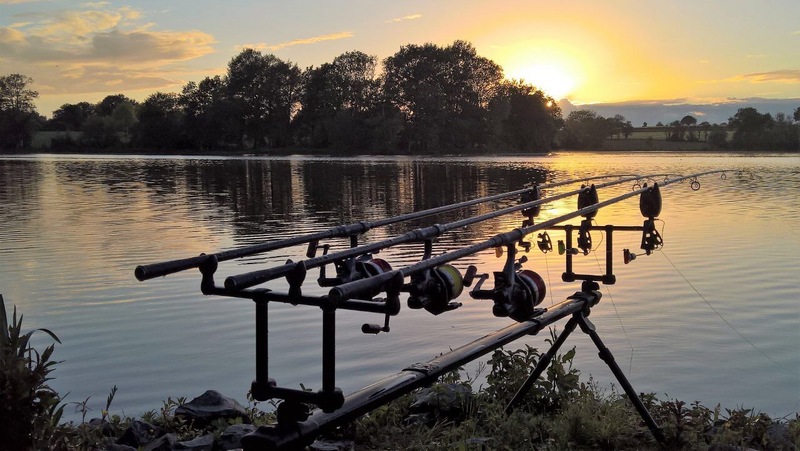 The lake is a holiday venue that is be enjoyed by all, and the management has succeeded with many anglers returning for what can only be described as an easy to fish venue with excellent facilities. 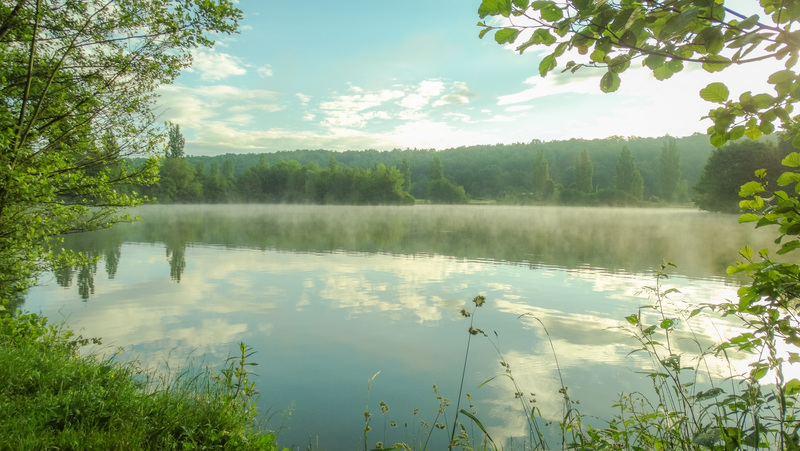 There are two lakes available to anglers, both of which are fringed by woodland and fields. The lakes are bordered by lily beds, fringed with reeds and with overhanging trees creating holding areas for the fish. The first lake is around 29 acres (12 ha) and features a central island, a real holding spot for the carp. The second lake is smaller at around 9.8 acres (4 ha). Both are fully accessible via a gravel path which runs around the perimeter of the lakes. The whole complex is very secure and is locked at night. All of the swims are accessible by car (where you can leave it during your stay), except swim 13, and there are several wooden gazebo-style shelters around the lake depending on which swims are chosen. Bait boats can be used and are also available for rent at 15€ per day. The lakes have hard, gravel bottoms and are both around 2-2,5 meters deep. Grosley also has the advantage of having a bar/restaurant for anglers. This is open nearly all year and offers meals during the day. There is also a small tackle shop selling general items such as hooks, bait (particles and boilies), leads etc. There are a good variety of swims to choose from at Grosley with a maximum of 20 anglers fishing at any one time. The swims are spread over the two lakes, with only two available on the small lake, giving anglers plenty of space to fish, and, unlike many lakes with hard, gravel swims cut into the banks, the swims at Grosley are natural and grassy. They are spacious and there is parking right behind most of the swims (all except 13). Swims 2, 15, 17, 18 and 19 are single swims with all the rest capable of being fished by two anglers. Swim 10 and 21 can be booked by 3 anglers. Several swims have a table and a small wooden chalet/gazebo-style building which can be used to store your gear or to cook in (with your own equipment). These are quite capable of taking a bedchair and many anglers sleep in them. They are available on swims 7, 10, 13, 17, 21 and 23. The stock in the lakes consists of a mix of mirrors and fully-scaled mirror carp with some lovely commons. There is a good mix of fish, all incredibly well-coloured, ranging from around 20lb (9.8kg, the natural, original stocking) to around 61lb (27,5kg). 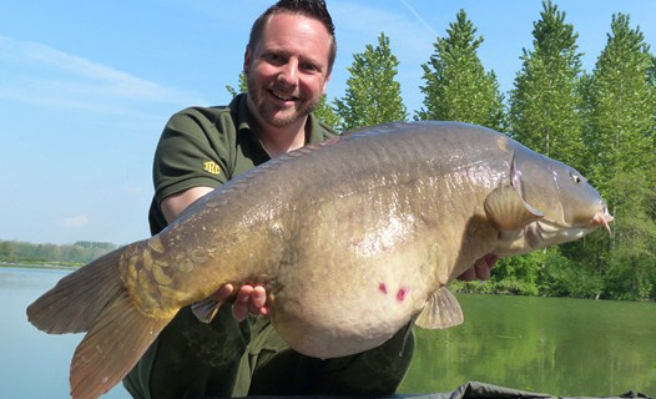 The average is around 24lb (12.2kg) and there are around 300 carp stocked in total. Carp of over 44lb (20kg) are regularly caught. There are a few crayfish in the lakes but not enough to cause anglers problems and there are no poisson chat. In the winter from 2016 80 commons between 25 and 35 lbs were introduced in the big lake. 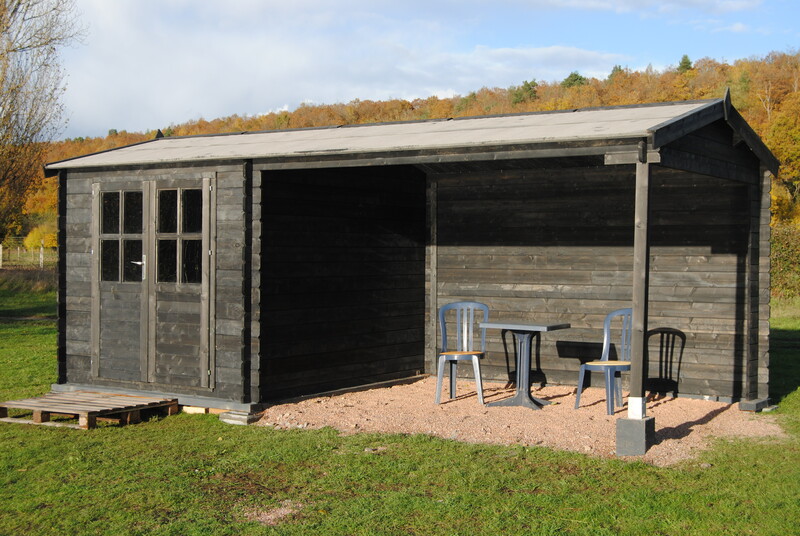 There is also a toilet/shower block for the use of anglers which also contains a fridge, freezer and microwave oven. Electricity is available for charging equipment. Fresh bread can be ordered on a daily basis and there is also a small tackle shop selling bait (particles and boilies) and general fishing items such as hooks, leads etc. Baitboats can be hired at 15€ per day. The use of a carp cradle is mandatory, and can be rented if needed, for 5€/day. There are mobile and silent power aggregates available (800W), 7,5€ a day. - Non-fishing guests: 70€ per week, 30 per week-end and 40 per mid-week. Having never fished in France before both me and my son-in law (Ade) booked a week’s fishing with Fishermans Holidays which was arranged with Thomas from their main office the support and help given to go was 1st class and very informative with lots of advice. On getting to Grosley we were greeted by Eric and his wife who made us very welcome with a complementary cup of tea. We were then shown around our swims and give some tips on how to fish. Although we were tired from the travel from Cornwall via Dover we very quickly got set up and fishing with four rods each and I soon had a bend in my rods with a nice fish 28.5lbs. A big thanks goes to the help from Howard at Nutrabaits in selecting the bait for the trip nearly all the catches came from Trigger and Salmon-Caviar and Black pepper Boilies. The time spent at the bait centre was well worth all the time prior to our trip. Eric and his wife also provided excellent food throughout the week and the need to take your own food is not required, the site facilities are excellent. This is the new shed on swim nr 3, free of charge. In the left part is enough space for 2 bedchairs. The covered deck protects you from rain and wind. There's electricity available in the shed, at a cost of 7,5€ a day. Within 50 meters you will find another shed with a fridge, a freezer and electricity for charging batteries. Within 100 meters is the sanitary building. Swim 2+3 is very good option for a group of 3 anglers. 3. Boats are not allowed, but it is allowed to use baitboats, you can rent them on the site for € 15 per day. 4. Swimming and wading is forbidden. 5. Allowed rigs: Always use tubing - “carp friendly” tube rigs (safety bolt rigs), no barbless hooks and hooks with micro barb (max. size 2) and nylon mainline. The hooklink may be stiff or braided, but should allways be less strong than the main line. Lead shouldn’t be heavier than 80 grams. 6. Not Allowed: carp sacs, bent hooks, braided mainline, tigernuts and peanuts. Only particles purchased at Lac de Grosley are allowed. Lead Core is not allowed. Rig tube is compulsory. Follow the intructions of the bailiff for all safety-measures on rigs. Each angler should have a big landingnet with a min. size of 90 cm and a big unhooking mat (min. 4 cm thick, 60 cm large and 90 cm long), a big weigh sling and Klinic to desinfect the hook wounds. 15. The owner and the bailiff can check the hooklinks at any time. 16. The owner is not responsible for theft, fire, injury or what so ever. 17. Each angler should sign the regulations declaring that he/she accepts them.